Could wifi thermostats coordinate zone firings? Having 3 zones pretty well dashes my hopes of outfitting the house with Nest thermostats; yes, we could have the main zone on a Nest, and the others not, but that offends my sense of order. And three thermostats for $750? Sorry, no. But this got me thinking. Wouldn’t it be cool if thermostats on multiple zones could communicate in order to coordinate boiler/furnace firings, to reduce short-cycling and firing losses? If the zones have a swing of, say, two degrees, one could opportunistically turn on even if it’s within one degree of its setpoint if another zone is firing, thereby maximizing the current boiler firing cycle. Or conversely, if one zone has low mass fin tube radiators, and another zone has high mass cast iron, perhaps it would make more sense to try to fire those zones separately, and coordinate that with thermostat communication as well. 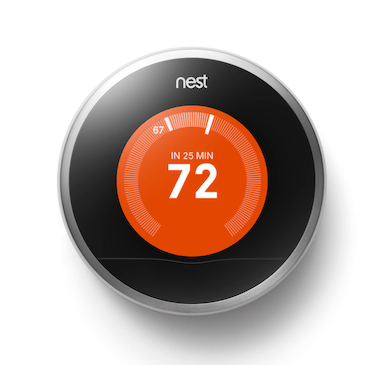 Nest finally has developed an API, as the Radio Thermostat (RTCA) folks did long ago [pdf]. But I’m not sure those are flexible enough to do this kind of coordination very well; it’d work better if it were in the firmware, I think. This entry was posted in Conservation, Energy by Eric Sandeen. Bookmark the permalink. Most of the multi-zone controllers work this way. They have dumbish thermostats located within each zone that either does just temp sensing or the nicer ones do temp sensing and set point adjustment but just report back to a central controller. I really like your blog, I have a similar blog about a hobby of energy conservation or in my case heat production from a homemade pellet boiler that I intend to convert to chip burning to save even more money. I intend to add photovoltaic in the spring, I have a Viesmann evacuated tube solar hot water system working now it is a fun hobby. Thanks Michael – I’ve actually come across your blog before as well, early on in my explorations of this stuff! I’ve actually thought about this as well and wonder why thermostats can’t do this. I actually find my Nest thermostat quite dumb. For one it isn’t even capable of intelligent humidity control for when the temperature is expected to drop which causes windows to freeze over, it just maintains a humidity set point. Also, it’s not even smart enough to not turn on before a set point reduction for heating, it will run even for a couple of minutes then shut down at the set point, it doesn’t know that it’s not worth it to start, on the flip side, it will turn off slightly before a heating setpoint rise rather than just running up to that temp. Be nice if there was a 30 minute or so swing in there that where it wouldn’t bother turning on or would stay on depending on the situation.